All I needed was one more point to be able to queue my new pally for LFR. Since it was Monday night, I really wanted to get an attempt in before everything reset. So I kept running stuff and I would get drops, but they were the wrong kind of drops. I got a shield in Gate of the Setting Sun (yay!) which was an upgrade, but I had the inscription fan in my bag so I didn’t give me an ilevel boost. Why not equip the fan? Shut up shut up shut up! Pallies don’t get fans! It’s bad enough I have a shaman with a stick! That fan is for my priest. No drops for me, but as I was leveling my paladin I was taking advantage of the bonus faction rep for running a random each day. She was already honored with Shado Pan so I knew eventually I would just get enough VP for the cloak and that would be that. Sure I wanted to be ready sooner than that, but Blizzard hates me so that was what ended up happening. Finally I could get into MSV LFR. I am being nice when I say that the Monday night LFR crew is not exactly the A-squad of WoW. 3 other holy paladins in with me? Yes, that sounds about right. For my troubles that run I got a new ring. Ok, that’s cool. Our illustrious raid leader then said that he was going to queue for the 2nd half so anyone that wanted to continue could stay. Elegon was a wipe when both tanks fell the first time the floor disappeared. One tank then left and we were in queue forever. I did consider leaving, but it seemed like this was the only LFR going on anyway and I really just wanted to finish. Finally one of the dps stepped up tank and he died. 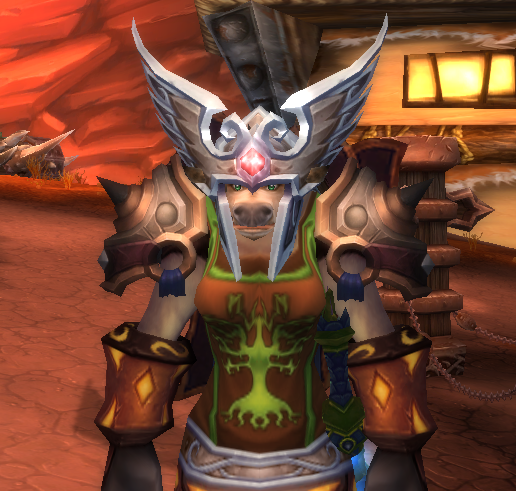 For that I got a new helm. The last boss was uneventful and I was done with my first week of MSV. Yesterday, when I ran it again, it was funny how much smoother everything went. Sadly the only drop I got was the same helm I already won. So that’s another toon with no shield. But at least I haven’t been given the fan. Omg I actually play my horde toons! So apparently that shirt was covering up her exposed belly. Erm ok. The weird cut-off for her belly looked wrong. There was so much detailing in the neck and top part of the robe that having her stomach randomly showing seemed really distracting. Shirt back on, get into queue. Right from the start it was a mess. It seemed like 10 seconds into the raid (the 2nd half) the entire floor was covered in purple fire and no one was taunting the dragons. Wipe #1. Mass exodus of people, including tanks, then off again. Same issue, wipe #2. Well, I’m done here. I decided instead to take Notari out to Magister’s Terrace and see if she could get some pretty clothes. She got some shoulders that went into her void storage and, after killing Kael’thas Sunstrider, she was picking through his spoils and found herself with a new pet. Ugh. 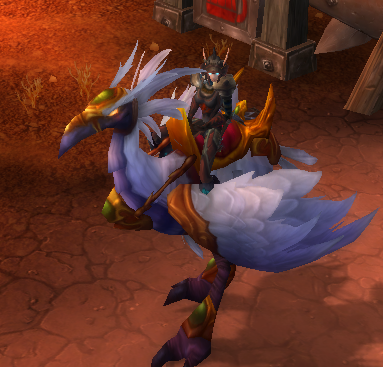 Ok, well at least it wasn’t the mount. I wasn’t done with masochism so I switched over to Tenderloyne the Forgotten Holy Pally and sent her into LFR next. It went much smoother for her; she ended up with a new belt and a head token. I hadn’t realized that she had never done the 2nd half of LFR before so it was kind of embarassing when her achieve popped up. Whoops. I don’t even think I would have taken her in if I realized she had never been there. That was only the first part of the embarassment, because once I turned in the head token and gemmed and enchanted that thing up, I put it on her and was stunned. Horrible. It was horrible. I had to take a ghetto screenshot because I couldn’t get one from the loading screen. The thing is so huge that most of it goes off the screen. Maybe when she gets more matching pieces it won’t look so awful, but I couldn’t stand it. I didn’t even think I had the patience to try to mog around it at this time. So I did the rare thing for a non-mohawked toon and turned off helm. Sigh. One day I will make you pretty, just not right now. After that, I wanted to run Sabryel the Other Blood Elf Toon But This One is a DK through MT and see if she could find some mog stuffs. I raced through that place and was feeling leet when I got the achieve at the end and saw that I had ran through it on normal. Oops. Switched it to heroic and went through again. She got a cool looking axe that would be cool to mog. She also picked up a dagger that I really liked, too bad DKs can’t use them. Killed Kae’thas again, got the achieve for Heroic MT and was going through his loot when…are you effing kidding me? Sabryel got the mount of her very first friggin’ try??!! Sonofawhore. I send two rarely played alts into a heroic with the intent of them finding some dress-up clothes and they each come out with something nicer? I don’t have the pet or mount on Zarigar. I mean, sure I don’t farm that regularly on Zari or anything, but it’s annoying that they picked up that stuff with so little effort. Sigh. The beautiful people get everything. Or fayle, if you prefer. Now that Notari was all pretty, she got the notion that she should step out of Orgrimmar and let the people gaze upon her gloriousness. So off into LFR she went. It’s always pretty telling when the dragon trash at the beginning goes terrible with many deaths. The people who drop at that point are probably the smart ones. Well, no one ever accused me of being smart. Ultra, then, is a disaster with one of the tanks not picking him up and it becomes death city. The amusing thing is one of the tanks says, “I’ve never been here and no one told me how the fight goes.” Well, that part is sad. The amusing part is that people still complain that it was the heals’ fault or that there was not enough dps. Really, guys, scroll up and read. The second attempt is also pretty deathy, but he goes down and I am still alive. Yay, it’s wonderful being pretty and getting to live! His drops include 2 helm tokens and 1 chest token. Homina-homina-homina…give me! I’ve ragged on Notari’s spirit helm so long–she needs this upgrade! And there is only one other mage, good for me? I won a roll! I won a roll! I got…the chest. Sigh. Oh well. It’s still very much an upgrade so it’s all right. Lootship is a one-shot deal. I am terribad at getting out of the shockwave part–if I had a nickel for every time one of Rep’s pallies has to use Lay on Hands on me–but Blink makes it 50x easier. On Spine I am dutifully spamming Arcane Blast when the trade window pops open and someone puts the helm token inside. Wha-? Is this a trade for the chestpiece? They can have it. Then the other person competes his part, so I complete the trade. Then get a whisper: I got this by accident. Enjoy. It really did make up for the part on spine where the new tank was warned not to take a healthy amalgamation through the bloods and then proceeded to pick up 9 stacks immediately. It was deadly, though the pretty mage once again lived. After that it was Deathwing. Another surprising one shot with an amusing 3 tentacle swords dropping at the end. Because I am not a whore, I pass on all the loot before I drop. Time to turn in my tokens! With new loot, that means new gems and enchants. 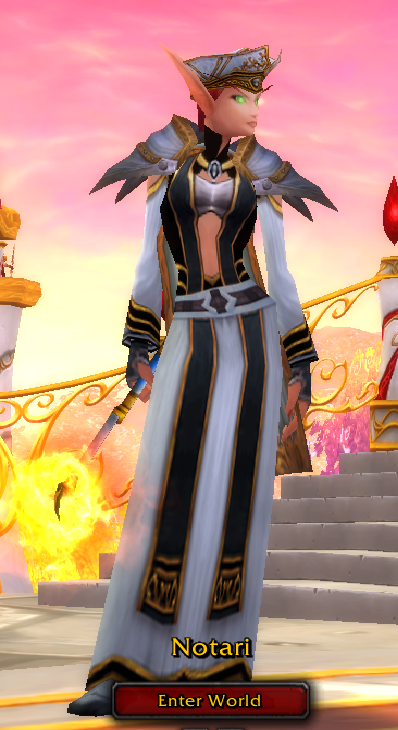 It also means I have to re-mog. 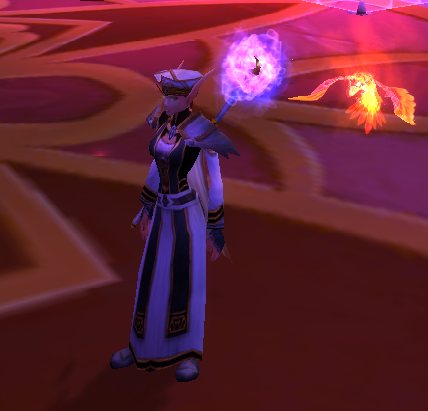 I went back to the white robe, even though it looks like a priest outfit. Ah well, that’s the beauty of mogging, I can change my look whenever I want. It’s good to be pretty.